Giveaway: CCF's Family and Finance Conference 2017. I've always budgeted my money even as a kid and I didn't need to do it. It also doesn't seem that way (my mom will object when she reads this haha!) because I like shopping but I really do budget. I set aside money for my savings, my shopping, my travels, and whatever it is I want or need. I'm used to handling my personal finances but now that I'm entering into another stage in my life (aka getting married), I want to learn how to budget for my future family. I even asked my former colleague Jill Sabitsana, who is a registered financial planner, for books I can read or seminars I can attend. And then I got an invite to CCF's Family and Finance Conference which is a whole day workshop dedicated to teach and help families manage finances better. How timely! 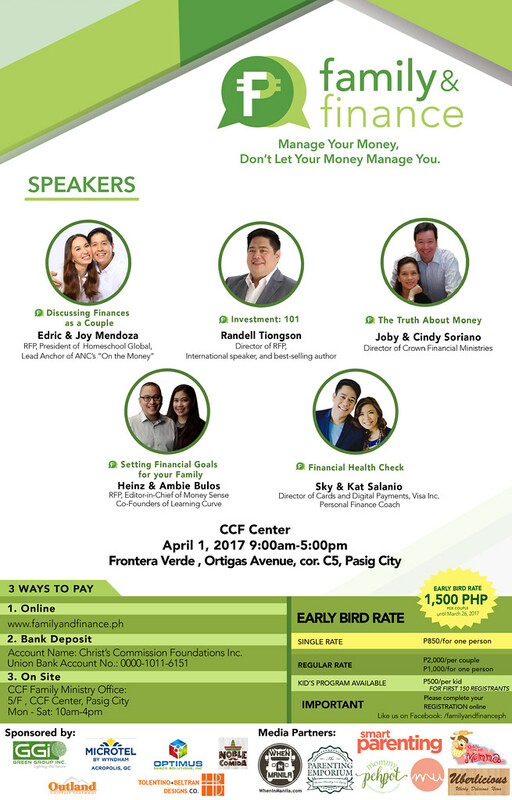 This year’s conference includes the country’s top financial speakers: Edric & Joy Mendoza, Sky & Kat Salanio, Heinz & Ambie Bulos, Joby & Cindy Soriano and Randell Tiongson, These speakers will be sharing how to set financial goals and manage finances as a family, as well as what to teach kids and the biblical perspective about money. And only until today, March 26, the Early Bird Rate is PhP850 per person or PhP1,500 per couple. Afterwards, the Regular Rate is PhP1,000 per person or PhP2,000 per couple. For more information, like Family And Finance PH on Facebook. See you there! ArmyNavy Burger + Burrito's B.U.D.D.Y. Combo. Boulangerie 22's Pokemon Go Cakes and Macarons.